An easy no-knead recipe for golden, fluffy focaccia. ANYONE can make this bread! Use this recipe as a base for any of your favorite toppings and impress your guests. In the bowl of a standing mixer or a large mixing bowl, stir together the all-purpose flour, whole wheat flour, yeast and salt. Drizzle with olive oil. With a hand mixer or a stand mixer with paddle attachment, beat on low speed while gradually pouring in the warm water. Slowly increase the speed to high, then beat for 1 minute. The dough will be very sticky. Transfer to a clean, lightly oiled bowl, turn once to coat, then cover with plastic. Let rise in a warm, draft free plate for 1 hour, until the dough becomes puffy, or store in the refrigerator for up to 3 days. While the dough is rising, prepare the caramelized onion topping. Heat the olive oil in a very large skillet over medium. Add the onions and salt, then sauté until they begin to soften, about 5 minutes. Reduce heat to low and let cook for 20 to 30 minutes, until deep brown, sweet, and tender, stirring occasionally. Stir in the thyme and red pepper flakes. Place a rack in the upper third of your oven and preheat the oven to 375°F. Drizzle a large baking sheet generously with olive oil. Gently turn the risen dough out onto the greased baking sheet. Coax and stretch to a ½-inch thick oblong shape (it may not be uniform), then cover with lightly oiled plastic and let rest 15 minutes if the dough was not refrigerated, or 30 minutes if it was. With your fingertips, “dimple” the dough by poking it gently all over with your fingers. 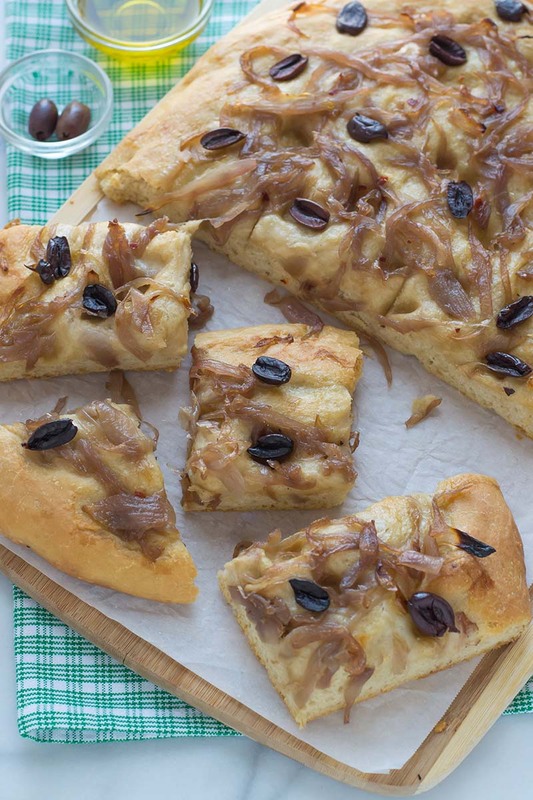 Drizzle additional olive oil over the top, then top with caramelized onions and olives. Bake until golden brown, 20 to 25 minutes, checking at the 15 minute mark. Serve warm or at room temperature. How can the onions be “caramelized” when there’s no sugar??? Great question! When you slowly cook onions over an extended period of time, the natural sugars in the onions caramelize.